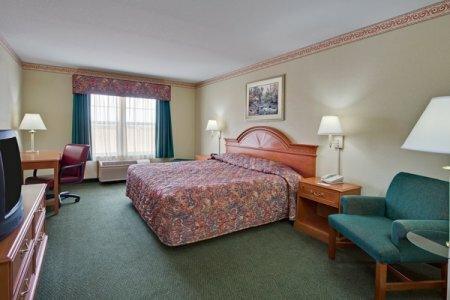 The Country Inn & Suites® by Radisson, Stockton, IL is the perfect home base for nature lovers and outdoor enthusiasts. Hunting, fishing, skiing, snowmobiling and golfing are all available close to our location off Highway 20. Families can enjoy fresh-air fun nearby at Apple River Canyon State Park, while couples seeking a peaceful getaway will find the family-owned Massbach Ridge Winery irresistible. 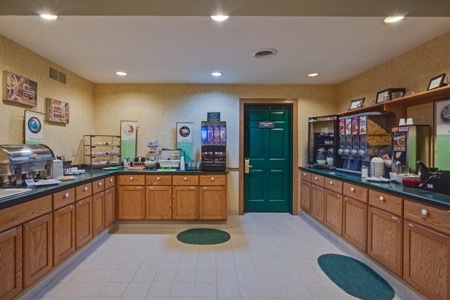 After visiting the top attractions in Jo Daviess County, you can relax with a dip in the hotel’s indoor pool, connect with family via free high-speed Internet access, or kick back with a book from our Read It & Return Lending LibrarySM. Our pet-friendly hotel* offers specific rooms for guests traveling with a four-legged friend. Fuel up for the day with our free, hot breakfast featuring a tempting selection of breakfast items such as Belgian waffles, French toast, biscuits with gravy, cereals and much more. When it’s time for lunch and dinner, you can choose from several restaurants located close to the hotel. Savor a juicy steak at The Rafters, or treat the family to pizza and burgers at Checo’s Family Restaurant & Pizzeria. Apple River Canyon State Park – Cast a line into the rolling river, stand in awe of immense limestone bluffs, observe native wildlife or enjoy a family picnic at this spectacular park, only 10 minutes away. Golfing – You can find 13 golf courses within 30 miles of the hotel, making Stockton perfect for golfers of every skill level. Drive, chip and putt to your heart’s content! Chestnut Mountain Resort – The 35-mile drive to this popular skiing destination is almost as beautiful as the slopes themselves. Picturesque views and exhilarating ski slopes combine to provide a wintry adventure you won’t soon forget. Deliver a professional presentation or host a family gathering for up to 35 attendees in our versatile meeting space. Free-high speed Internet access makes it easy to show a video clip or slideshow, and our complimentary coffee and water service keeps your guests comfortable. 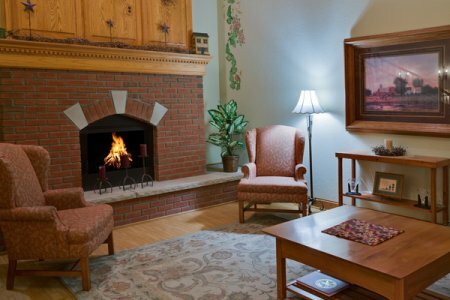 *Pets are accepted for an additional fee of $20 per room per night (non-refundable). Limited rooms are available for pets—double-queen only. Advance notice is required.